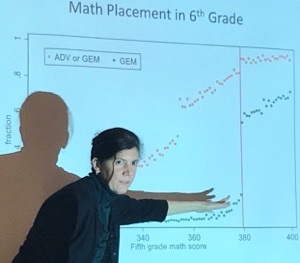 Incoming Economics Professor Laura Giuliano discusses the effects of mathematics acceleration in the sixth grade during a recent interdisciplinary research workshop. In today's globalized world, multilingualism is widely seen as a valuable skillset. Yet, school children who are learning English are segregated and stigmatized in ways that have negative impacts that persist for years, according to educational researchers who say it's time to cast aside the "deficit model" of non-native English speakers. Peggy Estrada, an associate research scientist in Latin American and Latino Studies, presented her team's latest research results during an informal workshop that focused on the educational needs and experiences of Latino and immigrant youth. The interdisciplinary workshop took place May 30 under the auspices of a research cluster created by Economics Professor Rob Fairlie with support from the Chicano Latino Research Center. "For four years, the research cluster has fostered discussion about academic outcomes among Latino, immigrant, and disadvantaged students," said Fairlie. "The goal was to bring together faculty from different departments to discuss issues around this important topic." Over the years, workshops have attracted faculty, researchers, and graduate students from departments across the Social Sciences Division, including Economics, Latin American and Latino Studies, Education, Sociology, Psychology, and Environmental Studies. Forty-three percent of K-12 school children in California speak a primary language other than English in the home, according to Estrada, whose talk was titled "Conceptions of Secondary English Learners: 'They call them lifers.' " Children who don't pass an English proficiency test when they enroll in school are classified as "English learners," or EL's, a label that carries a "deficit" connotation because it is based on failing to meet a performance threshold, she said. She noted that while these students come from varied backgrounds, the vast majority are U.S.-born, Latino, and poor. In research based on interviews and surveys of teachers and school staff in two districts across the state, Estrada and her team uncovered widespread stigmatization of secondary English learners labeled long-term ELs—due to not reclassifying as fluent English proficient within an assumed normative period. The host of "unintended negative consequences" on students include curricular placement that isolates them academically, linguistically, and socially. These conditions are related to diminished student academic self-efficacy and teacher instructional self-efficacy. Estrada called on educators to build on the competencies and potential of English learners and to support the English language development of all students. Also presenting during the workshop were Veronica Terriquez, associate professor of sociology, and Laura Giuliano, who will join the Economics Department in July as a professor of economics. Terriquez, whose talk was titled "Critical Civics Education and Action among the Children of Immigrants," invited feedback on a new theoretical framework she is developing to shed light on how young people, especially immigrants, learn to become civically engaged and politically active. Terriquez is exploring how to measure the impact of potential pathways to engagement that include parental engagement, involvement with civic associations, high school classes, and media—particularly social media. Immigrant youth tend to be less engaged than their native-born counterparts, she said, adding that her own survey research indicates that parental engagement appears to be a strong predictor of youth engagement for most youth, regardless of immigrant background. However, she has also found that the small proportion of young people who become involved in grassroots youth organizing or other social change associations during adolescence tend to exhibit particularly high levels of civic and political participation in early adulthood. Terriquez fielded questions and input from several workshop attendees, including Psychology Professor Barbara Rogoff, Economics Professor Lori Kletzer, and Education and Philosophy Professor Ron Glass. In her talk, "Heterogeneous Effects of Middle School Math Tracking," Giuliano discussed the effects of mathematics acceleration beginning in the sixth grade, looking at impacts on girls, students from low-income families, and students from groups that are underrepresented in so-called STEM fields (science, technology, engineering, and mathematics). Giuliano's research, based on data from a large, urban school district, will follow the educational outcomes through college of students who were subjected to test-based tracking.